A canvas printed thangka of Buddha Shakyamuni, the fourth Buddha to appear in this fortunate aeon. This modern interpretation shows Lord Shakyamuni in the Sleeping Buddha position. 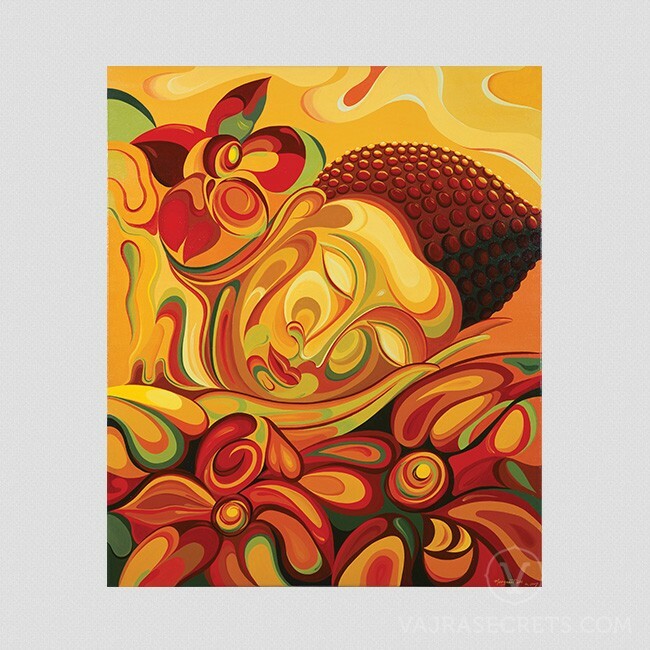 A canvas printed thangka of the Sleeping Buddha Shakyamuni. This modern interpretation of the classical 'Sleeping Buddha' image shows Lord Shakyamuni on his death bed entering nirvana. Lord Shakyamuni is the 4th Buddha or “Awakened One” of this fortunate aeon. He is shown with his right hand lightly touching the ground beneath him, symbolic of his invoking the earth to bear witness to the truth and virtue of his actions and words. After experiencing both extreme opulence and severe ascetic practices, Shakyamuni sought his own spiritual path – “the middle way” – that led him to attain Buddhahood during his own lifetime.